Longtime peace advocate Peggy Gish traveled to Iraq, along with others in the Christian Peacemaker Teams, to do what she does best: get in the way. Iraq: A Journey of Hope and Peace is her story of their work before, during, and after the U.S. invasion. Told in the first-person, Gish recounts her efforts to create relationships with Iraqis, fight for justice, and seek peace. Herald Press. Striking the right balance between constitutional issues and religious freedoms is a never-ending, sticky business. 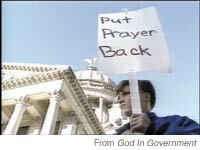 God in Government is an hour-long documentary that looks at the tricky mix of religion and politics—primarily in the United States, but also in India, Iran, and Israel, where the combination is sometimes lethal. Airs on PBS; check local listings. www.godingovernment.org. Harper San Francisco has birthed a new series of spiritual classics—four modest, accessible books that contain selected writings from John and Charles Wesley, Teresa of Avila, John of the Cross, and the anonymous monastic writer of The Cloud of Unknowing. Modern voices introduce each work—Peter Gomes, Patricia Hampl, Ron Hansen, and Tim Farrington, respectively—in lively, personal essays. A great way to dive into the classics. Each book has fewer than 150 pages.